While the Kids Date Parents can Date! 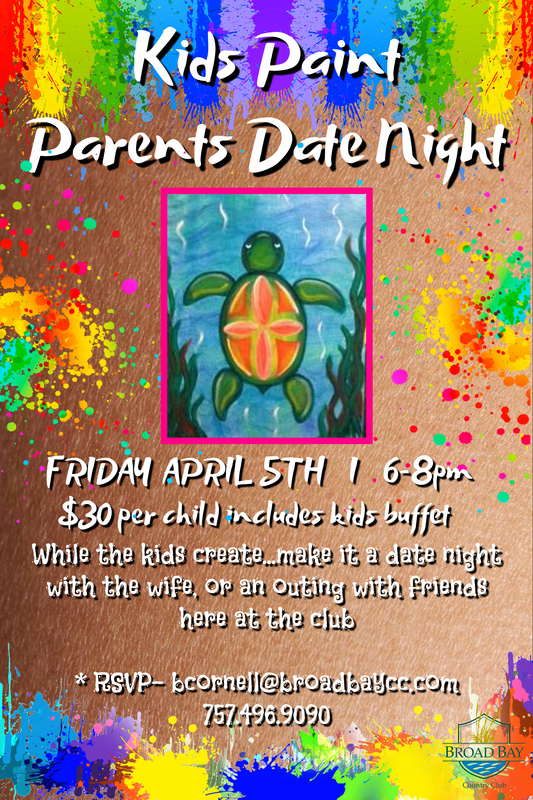 Visit the Club on Friday, April 5th for a quiet evening at the Club with that Special Someone while your kids are creating a masterpiece. For only $30 per-child, your kids will be provided the supplies & instructions to create the "Sea Turtle Surf" portrait pictured in the flyer with the staff of Pinot's Palette. Dinner for your children will also be provided via a kids buffet. While your children create feel free to date in the Clubhouse with a delicious meal and relaxing cocktail or ice cold beer. This event is by reservation only, all reservations must be made a week prior to the event. Call (757) 496-9090 today email bcornell@broadbaycc.com to RSVP.